Posted on Feb 5th 2005 by trekprops.de. 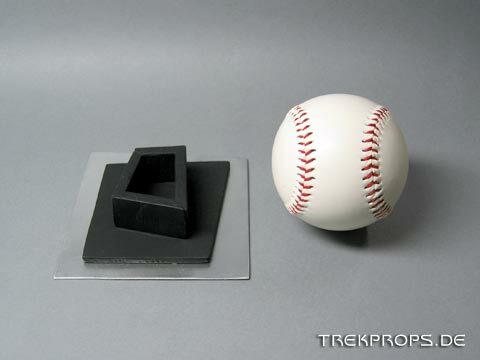 I admit, Sisko’s Baseball is a rather obscure prop. But since it took on a quite important role in the course of “Star Trek: Deep Space Nine” – even to an extent of a character of its own – I found it appealing to have it on my desk. To find a “common” baseball in Germany wasn’t as easy as you might think. I had to look in several places until I found a small store in my area which sells foreign sports articles. This was where I got my baseball. Unfortunately, it had several logos printed on its surface. In order to get them off, I had to scrape the surface of the ball using a sharp knife, thus removing the colorful graphics. 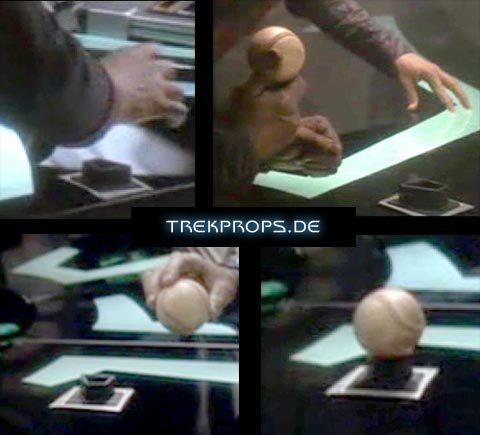 This damaged the ball slightly, which is however not a big deal, because the original baseball on Sisko’s desk is not exactly clean either. The desk stand was a gift from my brother which I got for Christmas in 2004. He built it himself and went quite professionally about it too! He became aware of the fact that I wanted to build one like this myself since I got the baseball but never got around to it, so he collected reference pictures (see below), drew up a blueprint, chose the materials and began construction. And all this at the age of 14! Reference pictures captured from DVD. The baseball on his stand. Baseball and desk stand seperately. Posted in Deep Space Nine, Prop Showcase. Do you know what happened to the real baseball (baseballs?) used on the show? Thanks for the response, I knew it was long shot. You are right, Sisko’s ball is a very obscure prop and I haven’t been able to track down what happened to it. Which is odd since it seems to be such a prominent place in a show where it seems that any item even remotely connected to the show is valued and sought-after. Don’t worry about your ball looking scuffed up though, it actually makes it much more authentic. In fact, if you really want a “used” look to the ball, take it outside and rub it vigorously with dirt, because that’s what baseball players do! When a ball is new, it has sort of a waxy finish on it. Rubbing dirt on it, or authentic baseball mud, (yes, there actually is such a product!) helps the pitchers have better grip and more control. 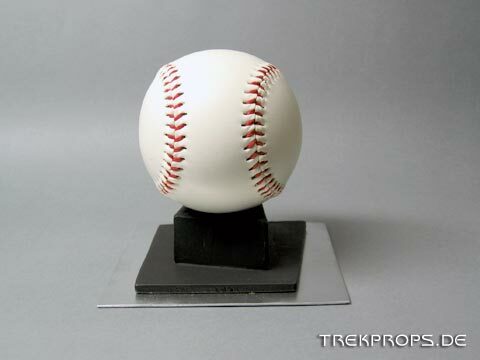 Rubbing dirt on the ball is the first thing an avid fan like Captain Sisko would do with a newly replicated ball! By chance does anyone have schematics to build this stand. I would love to have one in my first office. Want to see your picture next to your comment? Go get a Gravatar!